Mérimée was twenty years Stendhal’s junior but they became close friends. 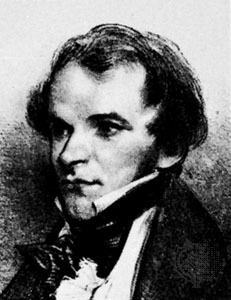 Their friendship came under some strain when the more successful Mérimée was elected to the Academy in 1839, not long before Stendhal’s death in 1842. In 1850 a pamphlet with the simple title, HB, was published without indication of the publisher or author. It was soon revealed to be Prosper Mérimée. The document offers a fascinating account of Stendhal through various anecdotes and yet its status has and continues to be questioned: is it a deeply personal tribute to Beyle or is it a sort of poisoned letter? Either way the interest of this short piece is without question. Today nobody is left unburied, thanks to police regulations, but we heathens also have to fulfil certain obligations towards our dead and not only just in keeping with government laws. I have attended three heathen burials. That of … who blew his own head off. His master, a great philosopher, and his friends were afraid of what people might say and so did not dare say anything. That of M… He forbade any speeches. And finally that of B. There were only three of us and we were so unprepared that we didn’t know what his last wishes were. Each time, at one of these services, I felt that something was missing, if not for the deceased then for ourselves. When a friend of ours dies on his travels we strongly regret not having said goodbye when he left. A departure or a death must be celebrated with some sort of ceremony because they are solemn occasions. If only for a meal, a time for concentrated thought, one needs something. That something is what Elpenor asked for. It’s not only a piece of land he requests but to be remembered too. I write the following pages to make up for what we were unable to do at the funeral of B. I wish to share some impressions and memories with some of his friends. B. was original in everything and that is a true compliment in these times where nothing is new. He was an enthusiastic liberal and was a real aristocrat at the bottom of his heart. He could not stand idiots and felt a violent hatred towards those who bored him and throughout his life he never knew how to distinguish between those who were nasty and those who were simply annoying. He displayed a deep contempt towards the French character and he was able to eloquently phrase all the defaults of which our great nation is without doubt falsely accused: flippancy, absentmindedness and silliness in words and deeds. In reality he possessed these same defaults to a certain degree and as for being absentminded, he once wrote a coded letter to M… from … and sent the code in the same envelope! His whole life he was dominated by his imagination and everything was done quickly and enthusiastically. However he liked to think that he only acted in accordance with reason. “One must be guided in everything by LO-GIC”, he would say, pausing between the first syllable and the rest of the word. But he had no patience for those whose logic differed from his own. Moreover he never said much. Those who didn’t know him put down to an excess of pride what was perhaps only respect for the beliefs of others: “You are a cat; I am a rat” he would often say to end discussions. One day we wanted to write a play together. Our hero had committed a crime and was tortured with guilt. “To get over his remorse, what should he do?” asked Beyle. He thought about it a moment and then replied: “He should set up a school of mutual instruction.” Our play didn’t make it any further than that. And so He turns the wheel and all the machines go wrong. B. told me that he had written a play of the life of…. He had depicted the hero as a simple soul, naïve and full of sensitivity and tenderness, but incapable of commanding men in this drama. “Is there love in your play?” I asked him. “Lots.” “And how about a favourite disciple?” He argued that all great men have had strange tastes and cited Alexander, Caesar, twenty Italian popes, and claimed that … himself had a weakness for one of his aides-de-camp. It was difficult to know what he thought about Napoleon. He was almost always in disagreement with whatever side was argued. Sometimes he spoke of him as a social climber, dazzled by the finery, who never obeyed the laws of LO-GIC. Other times he would speak with an admiration approaching idolatry. One moment he was a mudslinger like Courier and the other as servile as Les Cases. The men of the empire were treated as inconsistently as their master. Having left Moscow, on the evening of the third day of the retreat, B. found himself with around one and a half thousand men who were separated from the main army by a considerable Russian force. The men spent a deal of time feeling sorry for themselves and then the strong soldiers started shouting at the weak and managed to stir them into action, encouraging them to create an escape route with swords in their hand as soon as soon as the dawn would allow them to make out the enemy. Another type of military address: “You load of scum. You’ll all be dead tomorrow because you’re too pathetic to even hold a gun, let alone use one!” These eloquent words had the desired effect and at the crack of dawn we were marching resolutely towards the Russians, whose campfires could still be seen burning. We arrived there without being seen and found only a dog. The Russians had left in the night. During the retreat he didn’t suffer too much from hunger but it was absolutely impossible for him to remember how he had managed to eat and what he had eaten, apart from a bit of suet that had cost him twenty francs and which he still remembered with delight. He brought a volume of Voltaire’s Facéties from Moscow, bound in red leather, that he had taken from a burning house. His comrades thought it a bit silly to break up a magnificent edition. He also felt a bit sorry afterwards. M. B., Auditor to the Council of State, told me that he owed his life to B., who predicted the destruction of the bridges, made them cross the Berezina on the evening before the rout. It was almost necessary to force M.B. to make the several hundred feet. M.B. praised the level-headedness of B. and the common sense that did not desert him when even the most poised were losing their heads. In 1813 B. was witness to the rout of an entire brigade caught unawares by five Cossacks. B. saw around two thousand men running away, including five generals, identifiable by their rimmed hats. He ran like the others but not very fast as he only had one boot at the time and carried the other in his hand. In the entire French corps there were only two heroes who turned to fight the Cossacks: a gendarme called Menneval and a conscript, who killed the gendarme’s horse by mistake as he tried to fire at the Cossacks. B. was given the task of telling the emperor about the stampede, who listened in silent fury while playing with the iron device used to fasten the shutters. They looked for the gendarme to give him the cross but he was hiding, and denied at first that he was even present at the time, as he was sure that nothing was worse than to be identified in the midst of a rout. He was convinced he was going to be shot. On the subject of love, B. was even more eloquent than on war. I only ever saw him when he was in love, or believed himself to be, but he had only ever experienced, to use his terminology, two passionate loves , from which he had never recovered. One of the two, and I believe the first, was kindled by Madame…, whose beauty was at its height. He had lots of powerful men as rivals, including a favoured general, who one day abused his rank and ordered B. to move and allow him to sit next to the lady in question. The same evening B. found a way of telling a tale from his own imagination in which he allegorically challenged the general to a duel. I do not know if the fable was understood but it was deemed to be in poor taste and B. earned a swift rebuke from M.D., his relative and protector. This didn’t stop him however. In 1836, B. told me this tale in the evening underneath the big trees on the promenade at Laon. He added that he had just seen Madame…, now forty seven years of age, and that he found himself as much in love as the first day he had seen her. Both of them had had other passions in between time. “How can you still love me at my age?” She asked. He proved it to her and never have I seen him display so much emotion. He had tears in his eyes as he was speaking. Never had she appeared so desirable to him, and never had she experienced so much love. He sacrificed to pride the greatest pleasure that he could possibly have experienced. It took him eighteen months to get over it. “I was an idiot.” He said. “I wasn’t thinking. I was tied down by an unbearable weight, without being able to work out quite what I was feeling. It is the greatest of pains and breaks your spirit. Since then, I have recovered somewhat from this overpowering lethargy, but I have developed a morbid curiosity to know about all her infidelities. I had people tell me all the details. This caused me enormous pain, but I took a certain physical pleasure in putting myself in the various situations that were described to me. B. has always seemed to me convinced of that idea, much shared at the time of the Empire, that a woman can always be seduced and that it is the duty of every man to try. “Have her: it is afterall what you owe her” He said to me when I was speaking about a lady with whom I was in love. One evening, in Rome, he recounted that the Countess has just said “voi” instead of “lei” and he asked me whether he ought not to have raped her. I strongly agreed. I have never known anyone who was more gentlemanly in listening to criticism of his own work. His friends always spoke to him in the frankest terms. Several times he sent me manuscripts that he had already sent to V. and that were sent back with such marginal notes as the following: “Abhorrent. Style of a footman”, etc. When he published his book On Love, it was of this that he teased himself about the most (in reality quite unfairly). Never did these criticisms affect his his friendships. He wrote a lot and spent a long time on his works. But instead of correcting what he had written, he would redo the plan. He erased all the mistakes of the first draft only to make more, as I don’t know if he ever tried to correct his style. Although his manuscripts contained many crossings out, they were always written in one draft. His letters are charming as they are exactly like his conversation. He was very cheerful in company, crazy sometimes as he would often behave inappropriately and forget his manners. His conversation was often off colour, but always spiritual and original. Although he never made concessions for anyone, he was easily hurt by careless words. “I am a playful puppy and I get bitten.” He said to me. He forgot that he sometimes bit others himself, and sometimes hard. He did not understand that there were other opinions to his own on creatures and men. For example he was never able to believe that sincere believers could really exist. The priest and the royalist were always insincere to him. His opinions on art and literature were considered reckless to the point of sacrilege at the time and yet today some of those judgements are almost truisms. When he placed Mozart, Cimarosa and Rossini above the composers of the comic operas of our youth he caused a great stir. That was why he was accused of not having French feelings. He is however very French in his opinions on painting, even though he claims to appraise it in Italian. He values the painters with French ideas, that is to say from a literary point of view. He studies the canvasses of the Italian Schools like plays. This is still the way of appraisal in France, where we appreciate neither a feeling for form, nor an innate taste for colour. A distinct sensitivity as well as a long apprenticeship is needed to love and understand form and colour. B. lends dramatic passions to one of Raphael’s Virgins. I have always suspected that he loved the painters of the schools of Florence and Lombardy because their works made him think of things of which the masters were surely not. It’s typical of the French to try and rationalise everything. It is also true to add that there is no language that can properly convey the subtleties of form or the variety of the effects of coulour. As we cannot express what we feel we describe instead other sensations that everybody can understand. Beyle never really seemed interested in architecture to me and only came out with borrowed ideas on the subject of this art. I think I was the one who showed him how to distinguish a roman church from a gothic church and, what is more, to even look at either one. He always criticized our churches as looking drab. He preferred Canova’s sculpture to that of anyone else, even the Greek statues, perhaps because Canova had worked for cultivated people. He was much more concerned with the ideas that he aroused in the cultured mind that the effect he might have on someone who loves and understands form. “And Molière?” People would ask him. On the subject of Life, B. had a number of general maxims that, he used to say, once found to be true, had to be observed unfaililingly and unquestioningly. He hardly ever paused to consider for a second whether or not a particular case fitted into one of his general theories. He liked good food and yet he found it a waste of time to eat and wished that one meatball in the morning would cure him of hunger for the rest of the day. Today people boast about being gourmands but in the time of B. a man wished to be known for his energy and courage. How can you go on a campaign if you are a gastronome? The Imperial Police were everywhere, or so we pretended, and Fouché knew all that was said in the salons of Paris. B. was convinced that this massive espionage retained mystical powers and to that end would almost take all sorts of precautions for even the most mundane of activities. He never wrote a letter without signing it with a pseudonym such as César, Bombet or Cotonet. He dated his letters d’Abeille instead of… and would often open letters with some such sentence as: “I have received the raw silk and have put it in store in readiness for loading.” All his friends had their noms de guerre and he never called them by anything else. Nobody knew exactly which people he had seen, which books he had written or on which journeys he had been. I like to think that some literary critic in the twentieth century will discover the books of B. among the jumble of nineteenth century literature, and that he will do them the justice that they haven’t received from B.’s contemporaries. That was how the reputation of Diderot gew in the nineteenth century. It was in the same way that Shakespeare, who was forgotten at the time of Saint-Evremond, was rediscovered by Garrick. It would be nice to think that the letters of B. might be published one day. They would allow many people to know and love the man, whose spirit and whose excellent qualities now live on only in the memories of a small number of friends. The Odyssey, Penguin Classics, p.142, 11. 70-73.